As a beauty junky, I can't help trying load of products. I'm always excited to try on variety of products and brands because they may have different effects or function on our skin. Some may work but some don't. LOL there's so many all-in-one cleanser in the store nowadays and it's quite confusing to pick the right one. Here's another option again. See if it works on you a not. 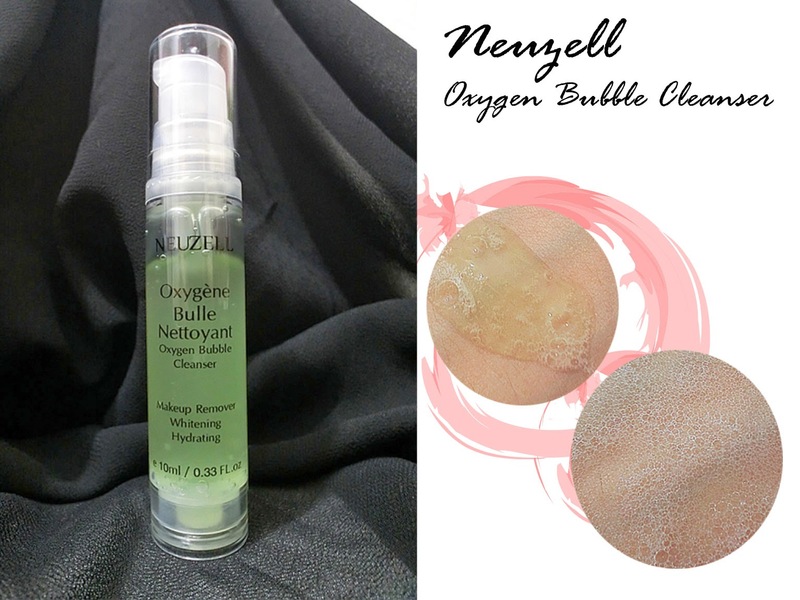 A review on something bubbly -- Neuzell Oxygen Bubble Cleanser (RM89.90 | 100ml) from HiShop. A multi-function cleanser which delivers oxygen and botanical active ingredients for instant detoxification and invigorates tired skin. It's gel form type solution which is slightly concentrated in yellowish-green color which consists of fresh natural gin tea scent. After seconds, the solution will turn into white soft bubble. Chamomile, it contains Flavonoid compound which particularly advantageous in care of sensitive skin as it shows remarkable vasodilator action, augmenting blood flow to the skin and soothing of irritation. Besides, it consists of antioxidant, anti-inflammatory and antispasmodic properties. Green Tea, renowned as anti-oxidant and anti-inflammatory compounds. Besides, it enhance skin protection and control sebum secretion. Algae, it enhance growth of collagen in skin that can firm and tighten our skin. Meanwhile, it moisturizes our skin. Matricaria Oil, a traditional medicinal herb which highly potent in soothing and healing troubled skin. Panthenol, with moisturizing properties which can also reduces fine lines, fight free radicals, promote healing and cell regeneration. It's a multifunction cleanser which consist the functions of removing make up, moisturize skin, promote collage production, anti-aging, whitening, soothing and deep cleansing. Here I have done a small test on its efficiency of removing make up. I have tried with waterproof gel eyeliner. The make up removing efficiency is not that strong as clearly seen that there's still recessive eyeliner mark on it. But it still function well in removing light make up overall the face like BB/CC Cream, all in one shot, fast and convenient. It suits all skin type as it's a paraben-free, artificial color-free, alcohol-free and fragrance-free products. Nicely effective on acne-prone skin. Moreover, it inhibits sun damaged and brighten our skin complexions. 1. Apply sufficient amount of cleanser on palm and spread it over the face. 2. Leave it on the face for around 20 seconds until bubbles formed. 4. Rinse off with tepid water. After using it, instantly I can feel that my skin has become moisturized and well-cleansed, leaves with smooth, fresh and comfortable feeling. It's so convenient for me to remove sun block or BB cream which I used to apply daily all in one shot. Yet, it's kinda troublesome for waiting the formation of bubble. Somehow, I love the process of bubbles' formation - the bubbly effect, it's so much like massaging my face, poppping. =D Guess it's good for sensitive as well. Do try it out! For more information of the products, visit www.hishop.my or HiShop Malaysia. P/s: Latest Giveaway (Beauty Box).